The word Thoran is often associated with South India. It’s a very common side dish during lunch and dinner along with rice in South Indian states. The very famous thorans from Kerala are Cabbage thoran, Carrot thoran and Beans thoran.. The list goes endless. 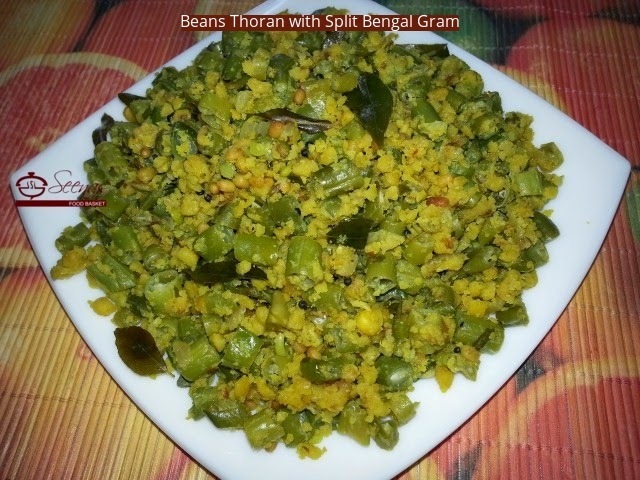 This is the recipe of easy and filling Beans and split Bengal gram thoran. Have you heard about ‘Poor Man’s Meat? It is Beans, because it has a great source of Protein, Vitamin A, Vitamin C, Calcium. Potassium, Magnesium and iron. Try this thoran. I am sure that you will love it. I should say that the end product would be superb.